More Renee Burn Relay Pictures! Christa and Ruth are sleep deprived in getting this video interview to me (we finished at 3 am LA time) so I hope you all enjoy this interview. It's a real keeper in my opinion! It's also my favourite Renee interview! Many thanks to Renee for taking the time for this interview and for being so candid. Renee was also given the money from the mini auction which raised $710 and she presented the checks to the Alissa Ann Ruch Burn Foundation! I hope you all enjoy this interview. Stay tuned for some more pics soon! Please, show your support for this wonderful woman in any way you can, and let's make this the best event EVER. There is some pretty cool pictures of Lucy and Renee on the Responsive By Photo site. Check it out here. AfterEllen.com was at the Dinah Shore Event with Renee and she was interviewed. You can now view the video clip. Renee will be dancing again at Lucy's concerts in NY. The Official XENA CONVENTION "The East Coast Visit of Lucy, Renee and Friends": Check out the convention image which we love as this will be on the official shirt offered at the convention. GOLD WEEKEND PACKAGES (the top of the line way to attend the event) are virtually SOLD OUT and will be removed from sale at the close of business Pacific Time MONDAY, APRIL 23, 2007. The Gold Packages offer the only way to attend the Friday Cocktail Reception and the Sunday Breakfast. Coming soon: MORE guests and info on the buses from the hotel to Lucy's concerts. And, we're also shipping "TWO FOR THE ROAD" which is the 2007 Burbank Convention appearances of LUCY and RENEE. Both our favorites are looking good and their chemistry is wonderfully entertaining as always. We think the format of both stars appearing solo and then together worked great and here's your chance to share an afternoon with L & R.
People can call to buy raffle tickets to support the Relay. The tickets are a dollar each and they have some pretty nice prizes Universal Hollywood, Jay Leno Taping, Lego Land and more�. You can purchase "Opportunity Tickets" and if they win and live out of state, yes, the folks who send things out will send their presents to them. (Los Angeles, CA)�Los Angeles City and County Fire Departments and members of fire associations throughout Southern California will gather at the Santa Monica Air Center (3021 Airport Ave.) at 7:30 a.m. on Saturday April 28, 2007 to kick off the 16th Annual Burn Relay to benefit the Alisa Ann Ruch Burn Foundation (AARBF). Funds raised benefit burn survivor children and their families as well as providing support for AARBF's burn prevention education programs. Two relay teams composed of 15-20 antique and modern fire apparatus and emergency vehicles will parade to 20 fire stations from Santa Monica to Long Beach and from Beverly Hills to San Marino. Celebrities, burn survivors, and firefighters will ride on the vehicles to each station where firefighters will donate funds which they have raised to benefit the Foundation from events such as pancake breakfasts and spaghetti dinners. Confirmed celebrities include one of L.A.'s favorites-Dr. George Fishbeck, and Rene� O'Connor, whom fans of Xena, Princess Warrior will remember as feisty, scene-stealing "Gabrielle". By mid-afternoon teams will arrive in tandem at the Los Angeles County Fire Department Station #118 (17056 Gale Ave.) for a Hotly-Contested Chili Cook-Off, complete with imported chili judges, opportunity drawings, and terrific food. The finale event is open to the public. Come and join the 16th Annual Burn Relay and show your support for our local firefighter heroes! Thanks to everyone who participated in this mini auction to raise money for the Alissa Ann Ruch Burn Foundation in time for the Burn Relay on the 28th April. It looks like there was a total of $310 raised. This is the second episode Renee filmed for the FBI Untold Stories in 1992. Renee is Officer Renee Lanot who is a young rookie cop brought in to help catch a killer who kidnaps and kills prostitutes in his van with blue carpeting (blue fibers) Trivia: Renee is wearing brown contact lenses in this episode. Renee appeared on this game show in 1991. Contestants place one bid on an offered prize; the player who bid closest (but not over) then gets to play one of several mini-games for an additional prize. One contestant, through various elimination formats, could find themselves winning a large showcase of prizes at the show's conclusion. There is a large wheel with various amounts up to one dollar, which contestants were asked to spin (Renee wins 35c) The contestant who came closet to one dollar in either one or two spins, without going over, was brought back to compete in the Showcase at the end of the show (Renee is one of the two contestants). Added scan of Hercules Legendary Journeys Trading Card for the episode "For Those Of You Just Joining Us" - Renee as that ever perky and slightly nutty Camp Wannachuck coordinator. The episode is just hilarious and made even more so with Renee as Sunny Day. All orders will have added a $4.95 shipping/handling fee automatically when you check out. I hope everyone has had a safe holiday period.. The brand new AUSXIP Charity Auctions site is up and running! AUSXIP Charity Auctions was born out of a desire to be able to auction off items for the Starship Children's Hospital and The Alissa Ann Ruch Burn Foundation charities without paying fees to online auction sites. 100% of the money raised on this site goes directly to the nominated charity. In it's short life we have raised thousands of dollars and hopefully in the years to come, raise a bit more money for these worthy charities. AUSXIP generates no fees and is completely free to register, to bid and to donate. Renee O'Connor Diamonds and Guns Auction for the Alissa Ann Ruch Burn Foundation. 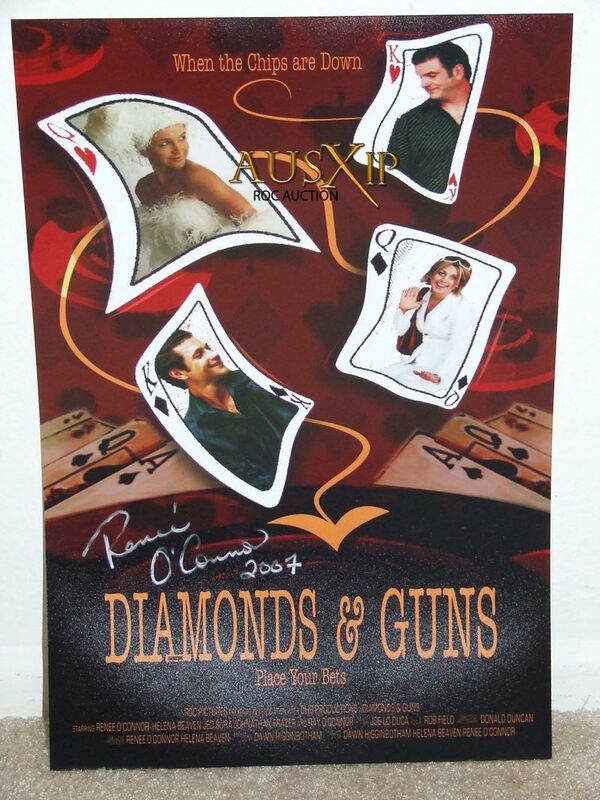 The following Diamonds and Guns poster was autographed by Renee for AUSXIP. All the money raised will benefit the Alissa Ann Ruch Burn Foundation. Here is a photo (it's too big to scan) of the poster and the autograph. "Look for a video interview with Renee and a few other guests at the AfterEllen.com party on the site next week."